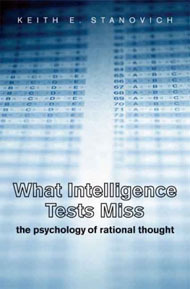 What Intelligence Tests Miss: The Psychology of Rational Thought, Keith E. Stanovich, Yale University Press, 2009. Many prominent thinkers over the last few years have pointed out that IQ tests fail to test many abilities of the mind that are useful for making our way in the world. Most argue that there are types of intelligence other than what IQ tests measure, such as emotional intelligence. In his insightful book What Intelligence Tests Miss: The Psychology of Rational Thought, Keith Stanovich frames the problem differently. He argues that it is acceptable and even useful to limit the term “intelligence” to the abilities that IQ tests measure, but that in addition to Intelligence Quotient (IQ), a measure of algorithmic thinking, we should also assess Rational Quotient (RQ), a measure of reflective thinking. IQ fails to measure our ability to exercise good judgment and to make good decisions. Smart people often do dumb things. This is because there is almost no correlation between intelligence and our ability to think rationally, that is to avoid thinking errors that lead to poor judgments and the resulting bad decisions that undermine our best interests. The prosperity of modern civilization contrasts more and more sharply with people’s choice of seemingly irrational, perverse behaviors, behaviors that make many individuals unhappier than the poorest hunger/gathers. As our technical skills overcome hunger, cold, disease, and even tedium, the willingness of individuals to defeat their own purposes stands in even sharper contrast. That we focus so much attention on intelligence and value it so greatly is not the problem; the problem is that we focus on and value it so exclusively. It makes perfect sense to value intelligence, because life in the modern world has become increasingly complex. This is certainly true of business. Consider the world of banking. In the movie “It’s a Wonderful Life,” the local banker who lent money to familiar folks in his community could have managed with less intelligence than the bank executives of today who oversee dozens of departments that each handle a host of intricately complicated financial transactions. But back then and now, a high level of rationality has always been required. Its importance, nevertheless, has become under-appreciated. In most professions, people are trained in the jargon and skill necessary to understand the profession, but are not necessarily given training specifically in making the kind of decisions that members of the profession have to make. On several occasions, I’ve written and spoken about this problem, especially as it relates to data analysis and presentation. Rather than learning the concepts and skills that are required, we put a software product on employees’ computers and assume that this is all they need. Software vendors have long promoted this line of reasoning in the way that they market their “intuitive,” “self-service” products. The truth is, we need a full range of cognitive skills to face the challenges of the workplace and of life in general. As a culture, we must embrace rationality by promoting its value and supporting its development and use as thoroughly as we’ve embraced intelligence. What does Stanovich mean by rationality? To think rationally means adopting appropriate goals, taking the appropriate action given one’s goals and beliefs, and holding beliefs that are commensurate with available evidence. Not everything in life requires rationality or even intelligence (that is, what IQ measures). Much of what we do is effectively managed through autonomous mental processes that involve neither. This is great, because it frees up the higher-order processes of cognition, which require conscious attention and greater energy, from being wasted on menial tasks. Walking and even driving are activities that are handled primarily by the autonomous mind. While the autonomous mind does a great job, we get into trouble when we let it handle situations that require higher-order cognition—intelligence and rationality rather than the automatic rules of thumb that the autonomous mind uses to make decisions. One of the important roles of the reflective mind is to interrupt autonomous processing when higher forms of thinking are required. To make better decisions, we need to value and develop the strengths of our reflective minds. Two important rational abilities, especially for data analysis, are the ability to reason logically and the ability to think in terms of probabilities. Unfortunately, relatively few people have been trained in these skills. Stanovich explains how thinking works based on this tripartite model consisting of the autonomous mind, algorithmic mind, and reflective mind. He talks about the role, importance, strengths and weaknesses of each. He spends a lot of time describing the causes of errors in rational processing (what he calls dysrationalia) and how we can avoid them. And, thankfully, he gives us hope by showing that rational thinking, unlike most intelligence, can be learned. He’s on a mission to make this happen. If you believe in the importance of rationally informed decision making and agree that it’s lacking, I recommend that you read this compelling book. Thankyou for blogging this. So often poor rational thinking is so evident in managed reports and even more worryingly in dashboards. We are long past the time that we need to move towards valuing the ability to think rationally as well as cleverly, and more importantly train people with the skills and tools that can support such critical thinking processes.